Last year we created Google Duo to bring simple, high-quality video calling to users on Android and iOS. Now we’re adding audio-only calling in Duo. So in those moments when video calling isn't an option—like when you’re about to hop on a crowded bus or have a poor network connection—you can stay connected with family and friends through audio calling. Duo audio calls work well on all connection speeds and won't eat up your data. This feature will be available starting today first in Brazil, and we'll be rolling it out to users around the world in the coming days. Since launching Google Allo last September, users in countries like Brazil have requested the ability to share documents in group chats. Starting today, Android users everywhere will be able to share documents and other files (.pdf, .docs, .apk, .zip, and mp3) with friends on Allo. And for users in Brazil, we're also rolling out Smart Smiley in Portuguese, which uses machine learning to help you find the right emoji faster. Tap the Smart Smiley icon on the compose bar, and the app will suggest relevant emojis and stickers to help you finish your thought. We built Google Photos to help people store, organize and share photos and videos in a hassle-free way. But it can sometimes be difficult to back up and share photos and videos, especially when you're on the go and don't have an internet connection. So today we're rolling out two new features to make backup and sharing easier on low connectivity. Now on Android your photos will back up automatically in a lightweight preview quality if you aren't able to back up in high quality, and still look great on a smartphone. 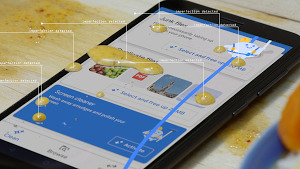 And when a good Wi-Fi connection becomes available, your backed up photos will be replaced with high-quality versions. We’re also making it easier to share many photos at once even on low connectivity. Never mind if you're at the beach or hiking in the mountains, with Google Photos on Android and iOS you can now share pictures quickly even with a spotty connection by sending first in low resolution so friends and family can view them right away. They'll later update in higher resolution when connectivity permits. 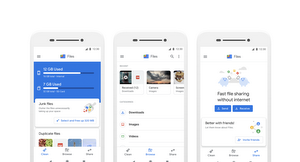 It can be hard to find time to organize your pictures, so Google Photos automatically creates animations, movies, collages, and albums. For movies, Google Photos will select the best moments, put them together with professional-style transitions, and set it all to music. With Brazil in mind, we recently rolled out a great example of these kinds of movies—your best photos from Carnival, set to a soundtrack of samba. We're adding a new location sharing feature in Google Maps that lets you tell your friends and family where you are and when you’ll arrive at your destination. You have complete control over whether you share your location, who you share it with, and how long you share it. You can stop sharing at any time. No more "where are you now?" messages back and forth. To manage your location sharing settings across Google products go to the "Your personal info" section of My Account and select Location Sharing. Last year we started experimenting with allowing people and places to post directly on Google Search. We started out with the U.S. election and have completed dozens of other experiments around the world. Starting today, in the U.S. and Brazil, we’re taking it to the next step and opening up the application process so that organizations and people within specific categories can post directly on Google. Now, when you search for museums, sports teams, sports leagues, movies and, in Brazil for now, musicians, you can find content from that participating organization or person, right on Google. So if you’re searching for the Henry Ford Museum in the U.S. or for Vanessa da Mata in Brazil, you'll see updates directly from the source with relevant information, like new exhibits, timely updates and interesting facts. Beyond these categories in the U.S. and Brazil, we’ll continue to experiment globally and look forward to making Search even more useful and timely. We made some Brazil-specific announcements at our event in São Paulo today as well, including plans to roll out the Google Assistant in Brazilian Portuguese on Android phones running Marshmallow or Nougat. We also extended a $5 million Google.org grant to the Lemann Foundation for an exciting tech-based education project in Brazil, launched the iconic São Paulo Museum of Art on Google Arts & Culture, and announced plans to roll out Waze Carpool in Brazil later this year. All of today's announcements were inspired by your feedback. We do extensive research in places like Brazil, and we use those insights to make new product features tailored to people's needs in mobile-first countries. The great thing about building products for the most difficult, limited internet conditions is that you end up creating great products for everyone, everywhere.